< . But what about physical security? From a data centres server protection; to shops or residencies that need to monitor guest and employee access – security is paramount. Surveillance cameras are the face of this physical security, the deterrent. But what allows such surveillance to record and archive effectively? – Network attached storage. What can NAS do for you? A network attached storage device, or NAS, provides users with a ‘closed’ system. Ensuring that changes can’t be made to the systems apart from those made in the user interface. Preventing corruption of files or data being manipulated or deactivated. NAS devices offer a range of options to restrict access, such as only allowing local or domain users to share folders. NAS devices can use built-in applications to record streams from IP surveillance cameras. The service is managed via client software and can be installed on multiple devices, while surveillance servers and assignment of cameras can be managed across the entire network. NAS devices enable regular, quick, and secure back-ups to the cloud, onto USB devices, or to additional NAS devices on the network. NAS devices can incorporate anti-virus capabilities to help provide a simple and reliable security system; for ultimate security, two or more NAS devices can be synchronised so that there is an entire off-site back up of all data. Network Attached Storage allows surveillance systems to store footage in digital format with all the processing handled by the surveillance camera – which streams to NVR for storage or remote viewing. Network Video Recorders are the complete system – pre-installed with a companion software making storage, archiving and monitoring simple. What’s more, with smart systems such as Buffalo’s TeraStation 5200 NVR plug-and-play is now possible thanks to its pre-installed award winning AXIS Camera Companion. When we discuss requirements with customers we often hear the same issues, how much storage should the customer invest in; and how much pressure video surveillance data is putting on their current systems and the need to expand their storage solutions. With this we decided to speak to Buffalo Technology about trends and recommendations, who, were able to shed some light. IP Surveillance allows you to configure how data capture is stored and how long to store it for. We learnt a staggering 77% of businesses store their video captures for at least seven days. 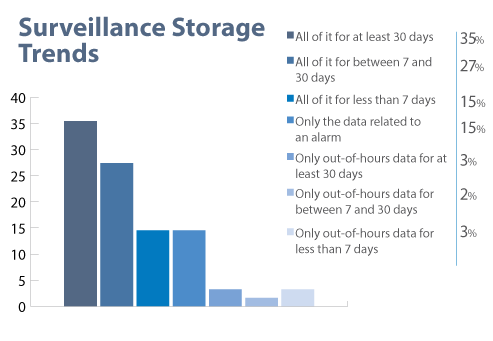 And that’s a lot of misused storage for many companies if your only requirement is to investigate out-of-hours or alarm event data for that length of time. It is a common misconception that there is legal requirement to store all surveillance data for at least 30 days. So it may come as a surprise to you that this is not the case. Public sector organisations are instructed to store surveillance images for no longer than strictly necessary, and there is no specific guidance on minimum or maximum lengths of time. The only requirement on users of CCTV is to conform to their public declaration. So, in general, as long as you remove images in the time that you say you will, you are in compliance. If a business states that they will store surveillance for 10 years, they are allowed to do so. The pressure of storage space is one that is only likely to increase within business’ over coming years with the constant need to increase storage. By configuring your surveillance system you can save on storage requirements. This is the first simple step on the road to cutting costs and make a smaller storage solution work for you. The other common complaint is the need for the biggest possible processor. But while you may invest in a NAS with the largest processor your money can buy, you won’t necessarily be using that within your surveillance platform. Fortunately, AXIS IP surveillance have set a pretty robust compression standard H.264. Known simply, as Zipstream. During testing AXIS were able to generate 50% fewer bits per second which in hand reduced the strain during processing. You may think that this would only reduce the audio and video quality, wrong. Buffalo and AXIS work hand in hand, like pen and paper. Together they make a formidable surveillance solution and with minor adjustments to your configuration, the small business’ need not fear a huge hit in their spending and can benefit from Buffalo TeraStation. So if a NAS upgrade is on your to do list, why not checkout Buffalo and get your solution setup right first time.